We sold this truss dock to John for use on a lake in Ontario, Canada. The dock system one 8×16’ truss dock and used a total of 12 barrels. This lake freezes over every year and John did not want to be bothered with taking the dock out every fall. 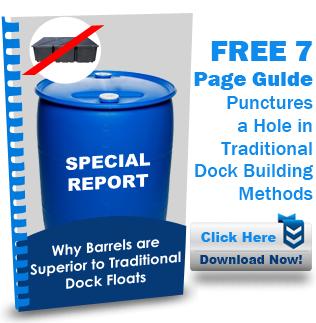 Our freeze-proof floating dock designed proved perfect for his application. John’s team spent about three days assembling this dock. Once assembled, the team launched the new dock and tied it off to the two existing docks. John is happy with his product and is expecting to order more docks in the near future.